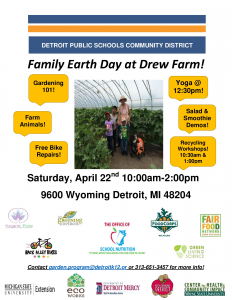 DPSCD is celebrating Earth Day by promoting learning opportunities for families and students on Saturday, April 22 at Drew Transition Center from 10 a.m. – 2 p.m. Family Earth Day at Drew Farm hosted by the DPSCD Office of School Nutrition, managed by national award winning Betti Wiggins, will teach families and students how to make fresh, healthy meals by preparing salads and smoothies featuring Drew Farm’s homegrown produce. Family Earth Day at Drew will kick off “Earth Week” featuring themed learning opportunities at schools across the district including home water and energy audits, campus cleanups, recycling field trips and cooking demonstrations. This entry was posted in Info News Center, News and Press Releases and tagged 260.